This may sound obvious, but the live aspect of a band’s existence is so important. For some bands, however, it’s everything. One such band who put a special emphasis on live performances is Leeds’ Esper Scout. Of course, the band still have a penchant for writing powerful songs that sound great recorded, but seeing them on stage is a different experience. It’s easy to get lost in the four-piece’s layered wall of noise which spans multiple genres, and it feels like the band are making a real connection with their audience. Tell us about your gigging history. Have you made it about the country much? And beyond? Reb: We try and get about as much as possible in our old faded Royal Mail splitter van. We bought it from a friend (Katie Harkin from Sky Larkin) a while ago and it gives us the freedom to do what we like when we like. We’ve played all over the UK and along the US West Coast. London several times, Bristol, Brighton, Liverpool, Manchester, Derby, Nottingham, Oxford. We’re yet to reach the Scots! I read once that one of you said that you will play any venue, big or small. What do you prefer? What are the pros and cons of both? Kirsty: I find playing a smaller venue can give people the sense of solidarity which we strive to evoke through our music and sensibilities. But I also love bigger venues for the learning curve and the push and challenge it gives me to use the space and still gain that togetherness between band and the audience. It teaches me more about the craft of performance. Reb: I agree, the smaller venues are great and I love it when we’re so physically close to the audience we can almost smell them. I also really loved playing the big venues. We recently toured with The Cribs and commanding stages like the London Roundhouse was empowering – we gained a lot from those crowds. It definitely gave us a confidence boost. How did your relationship with The Cribs come about? Reb: In a nutshell, Gary heard about us through Kill Rock Stars who put out a single for us last year. Quite soon after that I met the band in Jumbo Records where I work, where they were doing a signing. It all just kinda happened really naturally, we got on and they came to see us play in Wakefield and from there they asked us to tour with them. What is the favourite venue you’ve played in? What do you look for in a good venue? Kirsty: The Union Inn, Ulverston. Probably my favourite night out and crowd ever. Full of amazingly unique characters and diversity. Reb: I’m a sucker for the Brudenell in Leeds, our home town. In my opinion, a good venue will always have friendly and knowledgeable people working there, which makes everything so much easier and more enjoyable. I also really like Nottingham Rock City. I love it when we play in places that aren’t venues too. On our spring tour earlier this year we played in the basement of a Thai restaurant called Bangkok Bar in Manchester and all the bands shared a tray of noodles before playing. Sarah: Because the four of us are from Manchester we had family members there. The club night started setting up immediately after we finished; the addition of giant y-fronts and drag queens made things that bit more bizarre. Loved it. I don’t think we’ve ever had a gig we’ve not enjoyed. 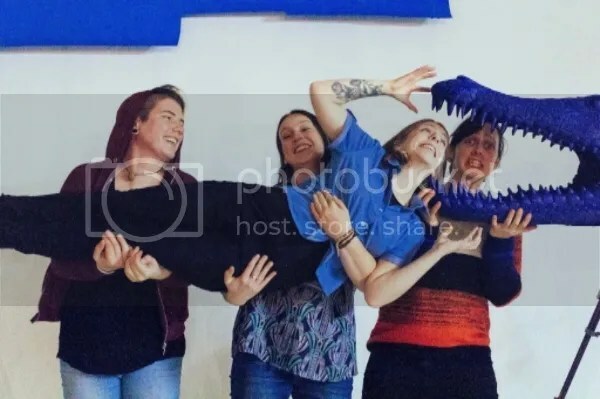 Even those where things haven’t worked out perfectly (gear breaking, personal issues, having to load in, set up and play in the shortest time), there’s always been a good humour about shows and being together making it work. A good example of that was the Victory Lounge in Seattle, where things were as rushed as they could ever possibly be at a floor show where the drum stool was a fixed bar bench. Both Wharf Chambers, Leeds and the 1-in-12 in Bradford are two really positive collectives of people who are mindful of socio-political issues and encouraging of supportive communities. I’d recommend getting down to a gig there sometime if you haven’t yet! Do you think it’s important for bands – when they get to a stage they are ‘too big’ for small venues – to revisit their roots once in a while and play smaller gigs? Kirsty: Always, although I only think bands become ‘too big’ for small venues because of crowd size rather than stature and ego. Any band can play any stage, even a shed, if they had instruments. But I do think it’s important to give back in a sense to the smaller venues that may have hosted you at the start of your career, which some seem to and that’s great. Touring can of course be a draining aspect to band life – do you have any ways of combatting the psychological hardships of your time on the road? Kirsty: Fruit, nuts and mutual respect. Being on the road and in a band with your closest friends gives you a shoulder anytime you need it, without anger or judgement. Reb: Yes I’d second that! Knowing each other helps lots too, we all understand the nuances in each other’s behaviour so that makes being on the road a doddle. We’ve been friends for a long time. Respecting each other’s need to sleep is good! We have the sleeping seat in the van and always have a pillow each. You’ve played some gigs across the pond before. How did these come about? Sarah: We supported a band from Oakland, CA who were managed by Kelvin Knight, the drummer for Delta 5. He watched our set, liked it and as a result of us speaking afterwards and becoming friends he passed us on to Portia at Kill Rock Stars. We went over to visit them in Portland and sorted a few dates up the coast. Friends of ours in Sacramento had been wanting to see us play and hang out again – so we made sure to see them and play ‘SuckFest’, the festival we’d joked about starting there when travelling the year before. Are there any differences between playing gigs in the UK and the US? Sarah: The free-pouring of spirits mean that you get a really dry mouth when you sing if you don’t drink enough water. More chances of having a pinball machine at venues too. What would you say the main point of touring and gigging in general is for you? Kirsty: Making friends and spreading positivity. Letting people know that playing ‘Hero’ by Chad Kroeger in your parents’ attic with your best mate can lead to awesome things! 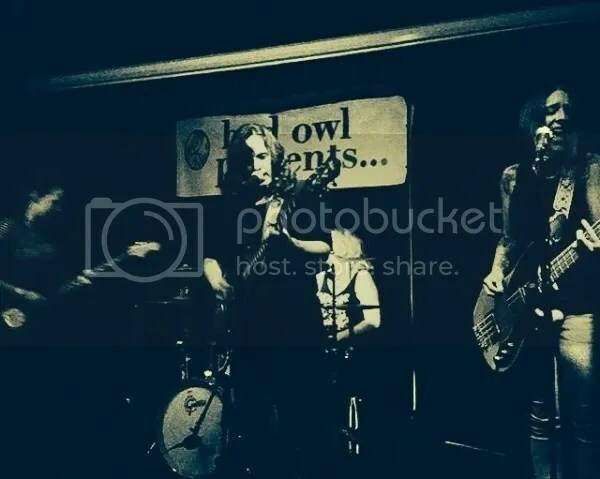 This entry was posted in Interviews and tagged alternative rock, brudenell social club, esper scout, gig, interview, kill rock stars, leeds, rock, wharf chambers. Bookmark the permalink.